PrideStaff, a national, franchised staffing organization, is pleased to announce that their Fresno office won the 2017 Best of Central Valley Business Readers' Choice Award in the Employment Service category. This is the third consecutive year that PrideStaff Fresno has been selected for this award. Our goal has always been to do what's best for our clients and candidates, and these efforts are what helped us win Best Employment Service yet again. Thank you, Fresno! PrideStaff, a national, franchised staffing organization, is pleased to announce that their Fresno office won the 2017 Best of Central Valley Business Readers' Choice Award in the Employment Service category. This is the third consecutive year that PrideStaff Fresno has won this award. Now in its fourth year, the Best of Central Valley Business Readers' Choice Awards provides an opportunity for readers of The Business Journal to highlight the local companies they interact with day in and day out. More than 150,000 individual votes were cast in this year's competition, which has expanded to include 35 different categories. Sean Akin, Strategic-Partner of PrideStaff Fresno, was honored to once again have his staffing firm counted among outstanding Central Valley organizations. "I want to thank our clients and candidates for voting and helping us win this prestigious award three years in a row," Akin said. "Founded in Fresno, PrideStaff is a local staffing firm with a national presence, so this award belongs to more than just the people who work in my office. This is really a group effort, and the help of our home-office team members is greatly appreciated. "Every member of our organization strives to live our mission 'Consistently provide client experiences focused on what they value most'," continued Akin. 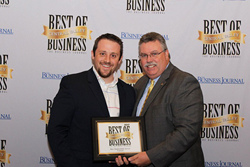 "Our goal has always been to do what's best for our clients and candidates, and these efforts are what helped us win Best Employment Service, yet again. Thank you, Fresno!"